New year, new month, new board. The board this month is designed with materials I had left over from a bulletin board kit. Before I begin, I would like to take a moment to explain that you will see that I have written about hot chocolate. My son's girlfriend recently informed me that not all of the country refers to this yummy hot milk chocolaty drink as hot chocolate. I understand that most parts of the country refer to this as hot cocoa, so I just wanted to make sure everyone understood that hot chocolate and hot cocoa are one in the same. This month's board is pretty much a matching board. I have different colored cups of hot chocolate, and the children will match the colors. Then on the other side of the board I have some pictures of gingerbread men. Some gingerbread men have two buttons, and some have three buttons. 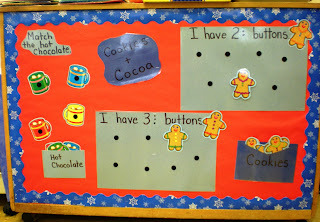 The children will have to count the buttons and stick the gingerbread man on the correct mat. It's pretty simple, but I thought the theme appropriate for our winter discussions. Stay warm. Some other ideas I had for this board were: matching snowflakes, but I didn't have any ready made (I know, my lazy is showing), or I was going to match colored birds to their colored nests, also thought about incorporating numbers, but then I thought this might be more of a spring board. I loved your January interative board! Hmmmmm, just what my room needs. :-) I would love it if you would share more information/pictures of previous interactive boards you have made and how you use them with the students. Truly inspiring! I actually do use velcro for the board. I don't have a problem with them pulling the velcro off, it sticky quite well. My biggest problem with this board is that when they try to separate the velcroed pieces, the actual pieces come off the board. I try to make sure they hold the pieces before they separte them, though I would love to figure out a way to attachthem to the board better. Good luck and thanks for reading.